This is a real, working installation of the GoVacation App. Click Log In to proceed. Or, try this from your own phone by going to http://GoVacation.mobi and logging in with phone number 678-555-1212 and booking ID 1234. Engage on any device, anytime, anywhere. 100% Compatible from one URL. No app to download from an App Store. Your .mobi brand domain. Connect to the GoVacation.mobi network. Guest can use one URL to connect them to the info associated with any of their vacation destinations. 100% branded throughout the app with your logo, not just the home screen. ...The quickest way to get to their vacation details. In a recent survey of guests, 80% said they prefer a mobile web app over an appstore app that needed to be downloaded and installed on their device. While App Store apps have their place in day-to-day use, for the vacationing guest, most guest prefer a mobile web app to connect them with information they need during their stay. 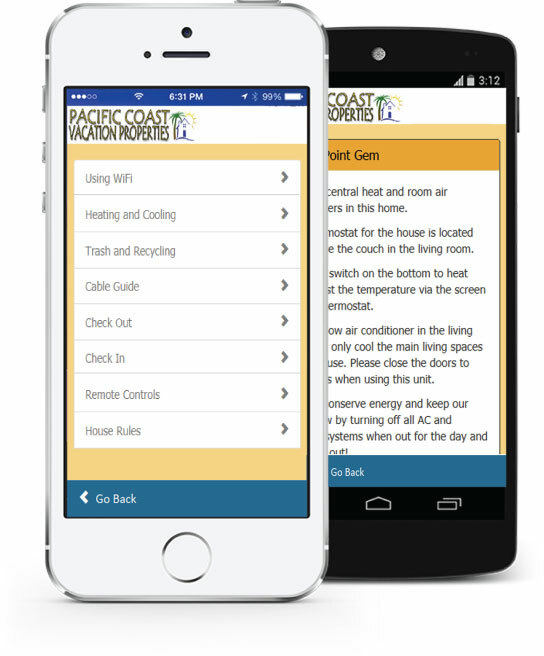 Mobile Web Guest Apps give developers and Property Managers the ability to change on the fly content by using dynamic content. Lower cost to deliver means much lower cost to you. Go Live with your guests once your account is completed. No apps to submit and wait for approval from the appstore. GoVacation.mobi works with all Booking Engines. Code generating API with most major commercial keyless lock systems. Alert your housekeeping when a guest checks out early. Or alert guests when their unit is ready to check-in. Plus allow guest to submit service requests right from their guest app. Then let Inspector route the service request to the proper department. 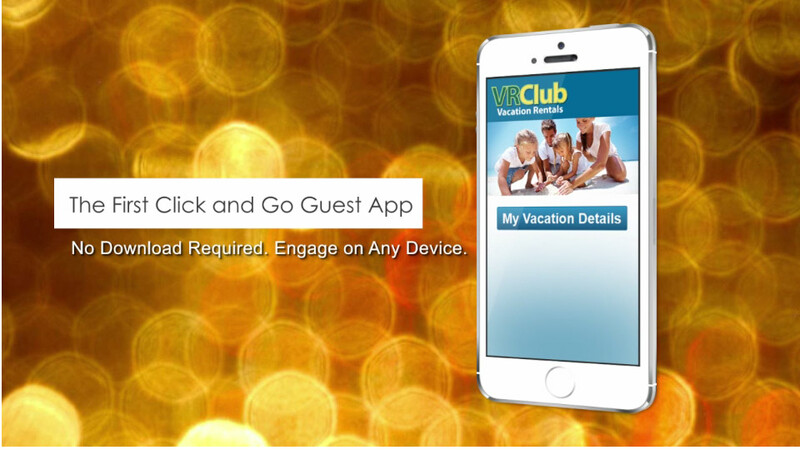 Better than Push notification, GoVacation.mobi notifications stay visible in the guest app until they expire. Remind guests to use the check out feature in the app. Take a survey and weather updates. You decide what and when to enter the notifications. 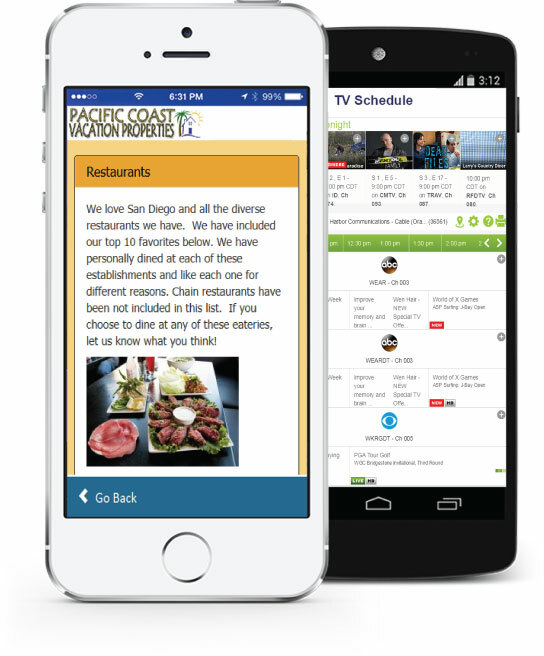 A Guest App that offers the most dynamic content available today. You can create and add Unlimited links. Showcase all the information related to the guest's unit which can be accessed directly from the app with the use of text, icons and images. Add Unlimited Guides to Your Custom App and Go Live in Seconds. No Limits. Guides to Food & Drink, Sightseeing, Wellness and Spa, Gear Rentals, Calendar of Events and Attractions can be included or you can create your own custom content. Get unilimited fresh content by adding an RSS feed to any content page. And for example, offer not just a TV Channel Guide, but a Guide with a TV Schedule. 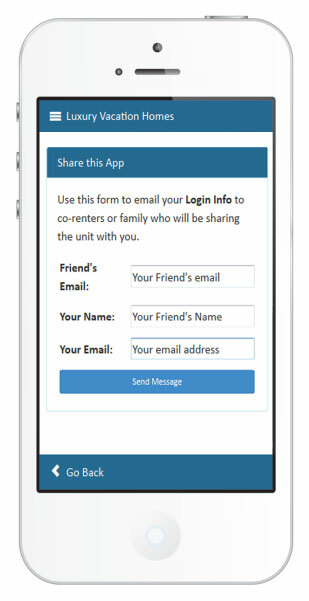 Guests can share their mobile app with everyone in their party. Auto Invite Guests. Your Guest App offers "Share this app" link. It allows the Guest to enter the name and email address of another guest. The system will then email login credentials (and a link) for that reservation to the other guests in the party. No download required. We designed the app to be self-service. No Setup fee required. Start working on your Mobile Guest App now. Professional Services are available for an even more enhanced experience for your guests. The dashboard will provide step by step process in which you will be able to add content and design according to your branding standards. Watch 8 quick tutorial videos to instruct you on your design and adding content. Your Mobile Guest App will be live instantly when you publish and then you can still edit and update without requiring continuous app updates for the guest. © Property Manager Tools, LLC. All Rights Reserved.